Hard luck to our Senior Footballers who narrowly lost out to Rasharkin GAC in the Junior Feis final 0-14 to 0-12. Brilliant committed performance from our boys who left everything out on the field. 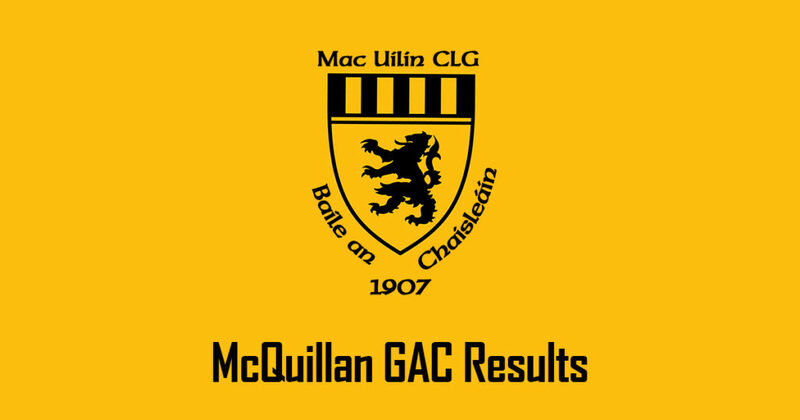 Hard luck to our U16s who lost 2-7 to 0-11 to Ruairí Óg CLG in the McMullan Cup Semi Final. Well done to Cushendall and thanks to Frank for the photos! Well done to the U16s on their win v Oisin Glenariff CLG. Next up is Ruairí Óg CLG. Photographs from today's Senior Feis match. Thanks again Frank McCaughan, now take a rest. Some photos courtesy of Neal O' Boyle from tonight's ACSHL win at home to Ballycastle.Thanks for the photos Neal. Well done to our Minor Hurlers who sealed a 4-21 to 0-11 win over Ruairí Óg CLG in the Darragh Cup on Friday night at Páirc MacUílín. Thanks to Frank for the photographs from tonight's Feile match. Thanks to Frank once again for supplying the photographs from last nights U16 match.